Yesterday I picked all the meat off our leftover Thanksgiving turkey and boiled the bones to make turkey stock. I felt a little like Ma Ingalls making my own broth, but the whole process was just too easy for me to forgo. I followed Kalyn Denny’s instructions for making broth with turkey bones and it turned out great. In the end, I netted 12 free cups of turkey stock for my troubles! That much low-sodium, organic broth would cost at least $10 at the grocery store. Besides saving money, it felt really good not to waste any parts of our Thanksgiving turkey. I had previously portioned out the leftover meat and froze it for use it for dinners in the next few weeks. Of course, the bones went into the soup pot. And the skin, tendons, and other leftover boiled meat bits? I whizzed those in the food processor along with a few tablespoons of wheat flour and made 3 cups of meat Kong filling for Barclay. (We’re trying to help him gain some weight and free treats make this much easier!) The only downside to all this thrify fun is that I have 12 cups of turkey stock sitting in my refrigerator, needing my attention! This butternut squash soup recipe is adapted from a vegan version published on Allrecipes.com, and it is one of Rami’s and my favorite winter comfort foods. Its spicy-sweet flavors are very forgiving, and I’ve made it with mashed sweet potatoes, canned pumpkin, and roasted butternut squash, depending on what’s handy. 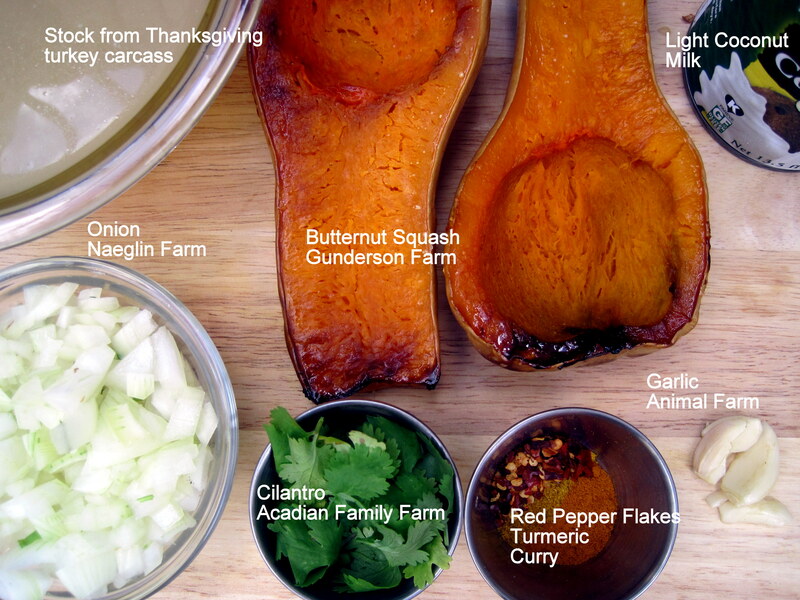 To save time, I always roast the squash or potatoes ahead of time and add them to the broth cooked and mashed. However, another option would be to peel and chop raw squash or potatoes and cook them in the boiling broth until tender. Since the soup goes through the blender at the end, either way would work just fine. Finally, a note about the light coconut milk in this recipe: it’s a must-include. In a pinch, you could substitute heavy cream, but the coconut milk’s sweetness enhances the buttery squash and spicy red pepper flakes. I used half a can of coconut milk in a red lentil sweet potato soup recipe I made last week. I froze the leftover coconut milk right in the can and it kept just fine until I needed the remainder for today’s recipe. Saute onions and garlic in oil in a heavy bottomed soup pan over medium high heat. Once onions are soft, add pepper flakes, turmeric, curry, squash, and stock. Stir to combine. Reduce heat to medium low and simmer soup, covered, for half an hour. Add coconut milk in the last five minutes of cooking. Blend the soup in the pot with an immersion blender, or allow it to cool some and blend carefully in small batches in a conventional blender. Season finished soup with salt and pepper to taste, garnish with fresh chopped cilantro. This soup doubles easily and freezes exceptionally well. 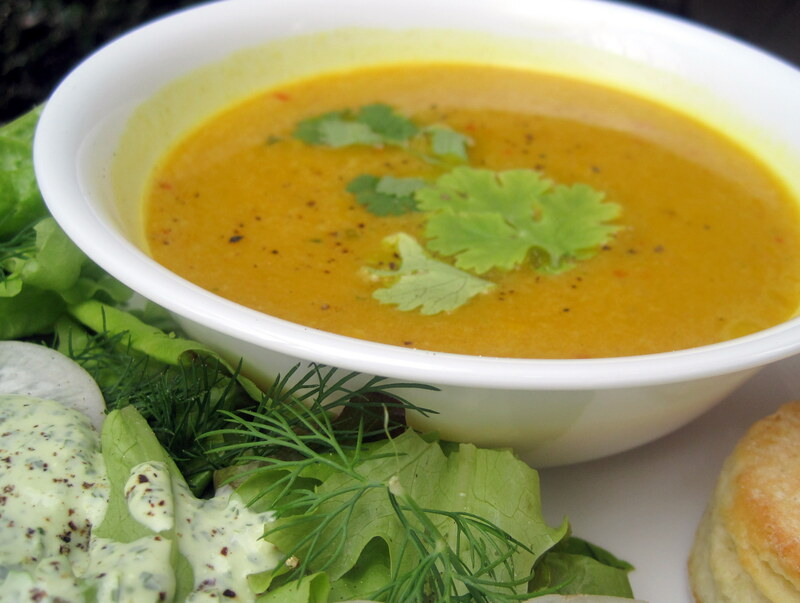 This entry was posted in Dietary Restrictions, Includes Meat, Recipes, Soups & Stews, Vegetables and tagged Butternut squash, Cilantro, Coconut Milk, Garlic, Leftovers, Olive oil, Onion, Sweet potato, Thanksgiving. Bookmark the permalink. This sounds so good! I’ll have to try it this winter. Love the Little House on the Prairie reference, too. Aw, thanks, Stephanie. I’ve been reading your blog, too. Glad to hear that the soup turned out okay!